You need a rinsing cup in your bathroom, you need a toothbrush stand in your bathroom, so why not combine them? Flip Cup does just that, while cleverly allowing the cup to dry with its curved lip exposing the interior while upside down. 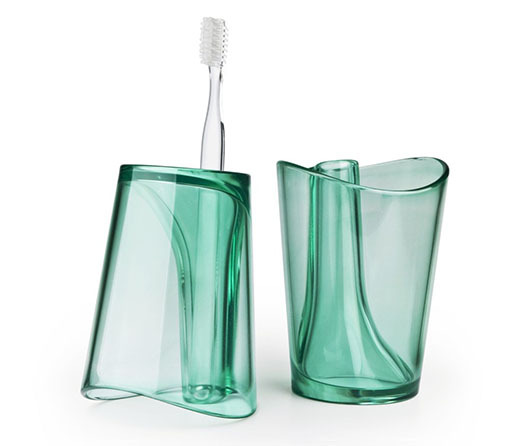 The minty-green color is a nice thematic cue to fresh breath (the whole thing looks like a freeze-frame of sloshing mouthwash), but any grime that accumulates inside the toothbrush holder may compromise that clean feeling! The toothbrush holder part shouldn't have a bottom - grime problem solved. Good point, stift - in fact, looking closely at that rendering, it's possible that there IS no bottom on the toothbrush holder!